Most asteroids are in the main asteroid belt between the orbits of Mars and Jupiter. 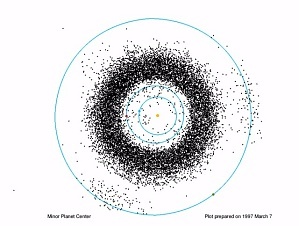 The image above is a plot prepared by the Minor Planet Center showing the distribution of main belt asteroids. Some asteroids have orbits that come close to or actually cross Earth's orbit. These are the Near-Earth Asteroids. Another group of asteroids called the Trojan Family circles the Sun in Jupiter's orbit. Two other classes of asteroids are the Centaurs, whose orbits are beyond that of Jupiter but within the orbit of Neptune, and the Transneptunians that are objects orbiting beyond (or crossing) the orbit of Neptune. The motion of a body like an asteroid can be influenced by the gravitational force of a larger body like a planet. The motions of two bodies can appear to be linked. For example, the Moon is in resonance with the Earth. It rotates once on its axis while revolving once about the Earth. This is why the Moon always presents the same face to the Earth. Some asteroids are known to resonate with planets. The simplest case is that of the Trojan Family. These asteroids revolve once around the Sun in the same time as Jupiter. The first discovery of an asteroid (other than the Trojans) in resonance with a planet was reported in 1972. Many asteroids are now known to resonate with Jupiter or Mars, but only a few with Venus or Earth. Plot of inner solar system showing main asteroid belt between Mars and Jupiter Sun is at center, blue circles represent (from center moving outward) the orbits of Earth (blue), Mars (red), and Jupiter (green). Image provided courtesy of the Minor Planet Center, Smithsonian Astrophysical Observatory.